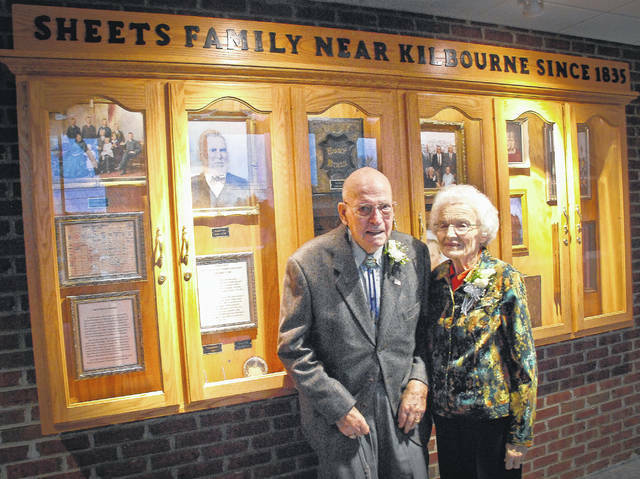 Charles and Betty Sheets stand in front of a display case depicting their family’s long legacy in and around Kilbourne since 1835. The display case hangs on the wall of the foyer in the new Brown Township Hall. Trustees, in front a crowd of about 100 township residents, dedicated the $1.4 million Brown Township Hall on Sunday. Charles and Betty Sheets, who donated $1.1 million for the construction of the new hall, were the honored guests. The township paid $382,000 for the hall’s construction. However, the zoning and permitted use of the property has been consistently contested by the township’s new neighbor, Bryan Schermerhorn. Schermerhorn initially filed a lawsuit against the township in the Delaware County Court of Common Pleas in May 2016 after the township denied his appeal regarding the zoning of the property. He contends that the property is zoned Farm Residential and does not allow for the construction of a government building. He said in his zoning appeal to the township that he disputes the zoning of the property and what it will allow to be built on it. Since Schermerhorn’s initial filing, the Delaware County Prosecutor’s Office filed an appeal with the Ohio Supreme Court Oct. 13 on the behalf of the township. Sheets talked about the display cabinet in the foyer showing the “legacy” of the Sheets family in the Kilbourne area. “We have tried to be good neighbors, but it’s been quite an ordeal,” Trustee Gary Stegner said. The board of trustees gave Stegner the authority to oversee the construction of the building. Trustee Steve Cole unveiled a new township logo that was designed by Andrew Clase, a sixth-grade student at Buckeye Valley. Clase designed the logo two years ago when he was in the fourth grade. Clase’s design hangs on the wall to the left of the entrance to the main hall alongside an old watercolor painting of the old Brown school. The watercolor shows a stone acorn over the top of the school’s main entrance. Trustees found the acorn and placed it in the front garden bed of the township hall. “The acorn came from the top of the front door of the front entrance to the school,” Sheets said. Sheets said the new building is a a real asset to the community. The first trustee meeting to be held in the new facility is scheduled for Tuesday, Dec. 12.